I hope you are ready for an other fun-filled Frugal Round-up, because I have some fabulous favorite projects from last week's party! 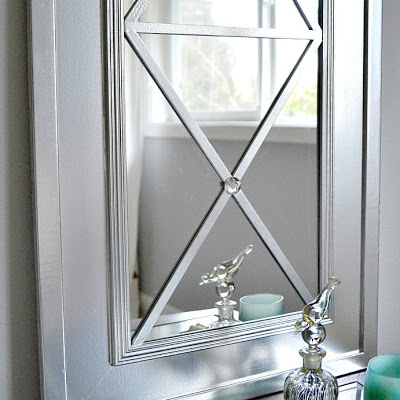 First up is this AMAZING upcycled door mirror project shared by Lilikoi Joy. I am crazy in love with this project. If you love them as much as I do, you're in luck because there is a detailed tutorial at the end of her post! And um, how beautiful is this master bath reveal which was shared by Mommy is Coo Coo? I'm cuckoo for it myself! And finally, are you ready for some spring blossoms? Here's an adorable project to do with the kiddos...a popcorn blossom tree shared by Journey to The Good Life. I love that mirror door! Thanks for hosting! Thanks so much for hosting every week and hope you had a wonderful V-Day! Hope your Valentine's Day was wonderful! Thanks so much for hosting! Thanks so much for hosting Wendy - hope you had a heart filled day! Thank you for hosting Wendy!! What an amazing surprise! Thanks Wendy for featuring our popcorn blossoms this week! I'm new to all of this as I've only been blogging since January so I'm really inspired to carry on. Thanks so much! Wishing you a wonderfully inspiring week. Hi Wendy - Thanks for the party! So happy to link up again this week! Thanks for hosting! Wendy, Thank you so much for hosting the party for us! The faves this week are lovely. I haven't made anything lately, just cleaning out closets & drawers. That mirror is gorgeous! Thank you for hosting.